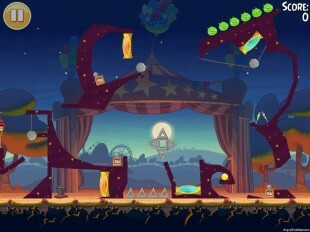 There are two Golden Eggs in Angry Birds Seasons Abra-Ca-Bacon. For complete details on how to obtain each of the Golden Eggs and for our video walkthroughs just click on the respective image below to be taken to that page. Golden Egg #43 – Big Juggling Pins is unlocked after you 3-star all levels. Once you’ve accomplished this goal tap the pins in the middle of the Golden Egg screen to open up the level. 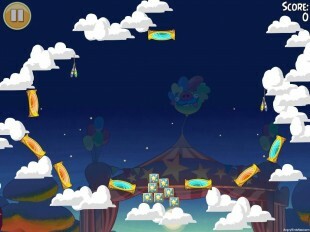 Golden Egg #44 – Level 2-6 has the Golden Egg, immediately under the slingshot platform. This Egg is very difficult to obtain, but it is possible with a little luck and a good deal of patience. ← Click here to go back to the main Angry Birds Seasons Golden Egg page. You guys at ABN do a fantastic job and get leaderboards and walkthroughs done SOOOOO fast when a new release comes out!! BIG Kudo’s and thanks. Can anyone help with the golden egg in 2-6 abra ca bacon? Tried to ricochet off first pillar, tried using shoots nothing hits quite right Thanks! @Cass I had trouble getting the egg as well, but if you click on the picture above and read the comments for that particular egg, you will find the comment of @teogeo This is the way I got the egg. Still in the process of making my videos, but I will sure include his strat for obtaining the egg when I upload them to my YouTube account.